Welcome to the future as seen by Peng Shepherd in The Book of M.
This is not Auntie M’s usual fare, but this debut is as creative as it is disturbing, and ultimately, sad. It starts when a man’s shadow disappears, something science is unable to explain, and soon spreads at a terrible price: those afflicted have a new power, but it’s at the price of their memories. Soon, memory gaps are filled with imaginings made real, a distorted Dali kind of existence. Ory and his wife Max are hiding in the forest to escape this new Shadowless world when she loses hers. Desparate to leave Ory before she becomes a danger to him, Max takes off. And so their dual journeys begin in this strange, almost unrecognizable world. It’s almost a family drama, too, with the characters both Ory and Max cross in their journeys interesting and vivid. 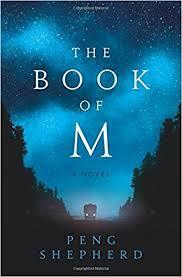 This is a thought-provoking novel, and while it won’t be for every reader, it’s haunting quality describes our humanity, with its mix of magical realism, in a post-apocalyptic world. It will certainly leave you thinking about questions you’ve never had to consider before. Good on you for branching out!